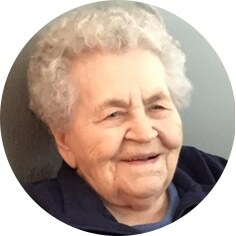 Mary Egroff, aged 96 years formerly of Perdue, SK, passed away in her sleep on Tuesday, December 18th, 2018 at her residence in Extendicare in Moose Jaw, SK. Mary was born on February 1st, 1922 in Stetichevo, Poland and came to Canada in August 1939 on one of the last ships to leave Poland before the official outbreak of World War II. Her family settled in the Arelee, SK district. Mary quickly learned to speak, read, and write English, and regarded the Bible as her favourite textbook. She married Nickolas Egroff on June 17th, 1940. After a year of homesteading, they moved to Struan, SK, then to Perdue where Nick set up a blacksmith and welding shop. Mary lovingly tended a huge vegetable garden, and was especially fond of her tomatoes. She enjoyed baking, sewing, and even in her senior years, continued to create wool quilts for everyone in her growing family. Mary had many friends in the Perdue area and particularly enjoyed attending the United Church there. When Nick passed away in 1999, Mary moved to Saskatoon, SK and later to Moose Jaw to be closer to family. She lived independently until 2014 when she moved into Oxford Place, and more recently, into Extendicare. Mary continued to be easy-going, content and friendly with everyone, and shared an abundance of hugs and laughs with her many caregivers. She was predeceased by her husband, Nick; sisters, Ruby Novick and Anastasia (Nettie) Andreychuk; brother, Walter Raichuk; and son-in-law, Hugh McGowan. Mary will be greatly missed by her three children: Don (Peggy), Joanne, and Richard (Sandra); grandchildren: Derek (Lucy), Jordan (Roxanne), Tania, Jennifer (Matt), and Jillian; great-grandchildren: Ashley, Kyle, Rylee, Addison, and Brady; sister, Annie Antifaev; brother, Fred Raichuk; as well as numerous nieces and nephews. The family extends their sincere appreciation to all of Mary’s caregivers, friends, and volunteer angels who shared the last chapter of her life with their care and attention to her needs. A Graveside Service will be held at the Perdue Cemetery in the spring where she will be laid to rest beside her husband. In lieu of flowers, donations in Mary’s name may be made to the Extendicare Family Support Group, 1151 Coteau St W, Moose Jaw, SK S6H 5G5 (306)693-5191. Arrangements are entrusted to Moose Jaw Funeral Home, 268 Mulberry Lane. Michelle Surtees Funeral Director 306-693-4550.